Ay Caramba! Las Vegas attitude combined with a Mexican fiesta atmosphere! 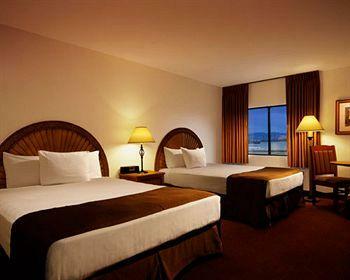 Fiesta Henderson Casino Hotel Las Vegas has relatively large rooms, but they are certainly second class. They are not Mexican themed, really. The rooms have light-colored carpeting and woods, large beds, chairs and a table. The entire hotel is small so you're not going to get a high room and it's tough to sweet-talk them into a suite. The bathrooms are average with tub/shower combos, single sinks and standard-quality towels. Beware the bogus, yet mandatory "hotel amenity" tacked onto your room rate. Good. Everyone out here is pretty nice to you. Heck, they're even nice to us. Not nicer than our grandmother, but they don't have to be because we don't know where they live. 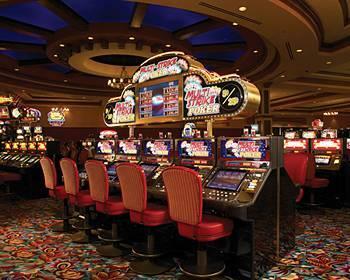 Check-in and check-out is easy, provided you can find the front desk in the wacky casino. Fiesta Henderson Casino Hotel Las Vegas gives you shampoo and conditioner. One for cleaning, one for glossifying. Locals in the prime retirement years of their lives. Fiesta Henderson Hotel and Casino Las Vegas is a mecca for older folks, and they love the cheap buffet here. 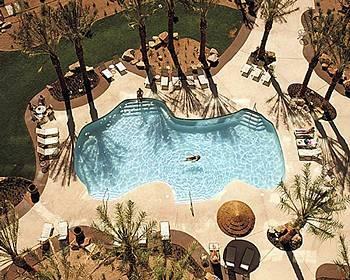 Considering all the space Fiesta Henderson Hotel and Casino Las Vegas had to build a fantastic pool, the small hole in the ground is a disappointment. Sure you can swim in it, but you would think they would have gone a little more all-out just because they could. Its biggest selling points are the palm trees around it. If you're not picky about your hotel, you might pick this one. It's cheap, therefore it's nothing to write home about. 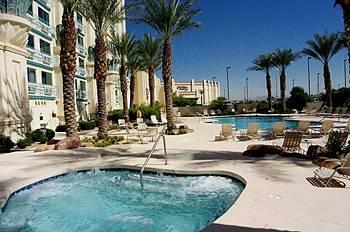 But there are other cheap hotels in Vegas too. The usual suspects are in their small pit. Blackjack, craps, roulette, Let it Ride, Pai Gow and occasionally an oddball game. But mostly, this casino is here to serve the locals slot crowd. Fiesta Henderson Casino Hotel Las Vegas has $3 blackjack most of the time, which is three times our limit. They also have $3 craps with our favorite, 10x odds. Roulette has 50-cent chips and $2 min. The limits may go up on weekends, holidays and weeknights, or at their whim. The video poker is all right, but you'll find better downtown or a few other Off-Strip joints. Still, it's decent because there are some full-pay VP machines. Slots are pretty standard. Very good, as long as you're tipping. 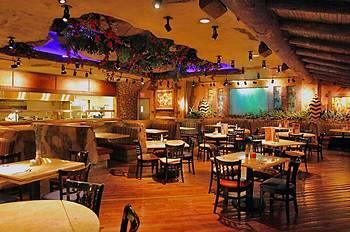 Our waitress at Fiesta Henderson Hotel and Casino Las Vegas came by three times in about 40 minutes. Join the mediocre Amigo Club to get your slot points. It pays about the same as the other tight Station properties. Expect $10-$20 play at the tables to be the buffet level. About 34, with about four biggies in there. About 120 including the nearby sports bar. 91 of the seats in the book proper have their own TVs which comes in really handy if you're like us and get most of your inspirations for horse picks from infomercials. There is some bar-type seating at round tables, too. About 11 with nice, shiny electronic boards behind them. Well, not really since the sports bar is adjacent and you're supposed to go there when your buds get parched. Nope, but there is plenty of fast food nearby. Because, you know, nothing like a big, greasy unhealthy meal after sitting in a sports book all day. 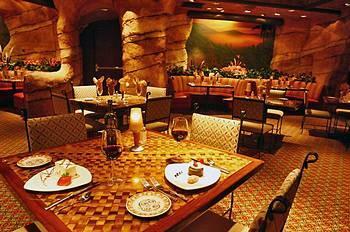 Fiesta Henderson Casino Hotel Vegas has 4 on-site restaurants, including that famously fancy one, Denny's. 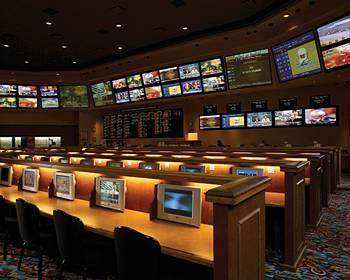 It is nice to see some investment in this place, and man did it need a better sports book. The old one sucked. 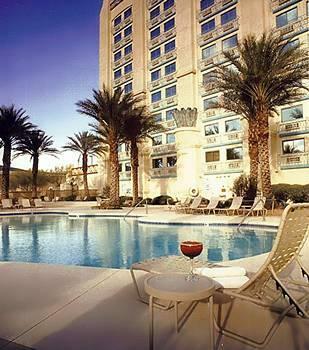 Fiesta Henderson Hotel Casino Vegas now has one that is better than average. Five tables, blue. They sort of walled it off, but the tempting odor of nachos and sounds of video poker waft in. Average to slightly below average chairs, probably hand me downs as well. Any kid who had a lot of older siblings knows how much it stinks to get hand me downs. It's on the casino floor. So, you have casino noise and the sound of dyspepsia from the restaurant. Texas Hold 'Em in 3-6 spread, and 1-2 no limit on a very rare occasion. Lessons midweek at 2 pm. Be there or be square. Or just don't get a lesson. Not very crowded. There is rarely a wait at Fiesta Henderson Casino Hotel Vegas. $1 an hour in comps on your Amigo slot club card. Not good, but not worth beating, either. These are locals who don't want to go deep in their pockets. So, while they don't play well, they also don't wager much. They have tournaments a couple days a week, but they aren't worth going out of your way. In fact, there are better tournaments closer to town. 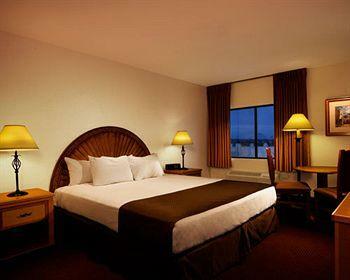 Fiesta Henderson Hotel and Casino Las Vegas gives you one big king bed or two queen beds, a two-chair dining set and high speed Internet access at no additional charge, after the resort fee of course. You'll be able to see out of the tinted windows, but the sun won't be looking in, not as much at least. You might still want to shut the curtains if you want to day-sleep though.